On 11 January, it will be exactly 25 years since Algeria’s military staged a coup to prevent the Islamic Salvation Front (FIS) from winning the first multi-party elections after the country’s independence. What could have been the start of an early Algerian spring – years before anyone dared speak of a so-called Arab one – instead triggered a cruel and dirty decade-long civil war. Murder, torture, disappearances and the slaughter of whole villages became commonplace. An estimated 150,000 to 200,000 people were killed in what is today a by and large forgotten chapter. Unfortunately, the Algerian conflict bears some remarkable parallels with the events that have been unfolding in the Arab world since the end of 2010. For example, it all started in a very similar fashion with a series of mass demonstrations and riots. As the oil price fell and Algeria’s economy went into crisis mode, the country’s disenchanted youth in 1988 took to the streets in protest against rising unemployment and poverty levels. This in addition to a wideky shared belief that the country’s immense gas and oil riches never reached the pockets of the common man. In response to the protests, which saw hundreds of people killed, the National Liberation Front (FLN), Algeria’s sole political entity, amended the constitution to allow for free multiple-party elections for the first time since independence. Thus, in 1989, the FIS was born. Strongly influenced by the Muslim Brotherhood, the party quickly gained in popularity. It became the biggest party in the municipal elections of June 1990 and went on to win the first round of the parliamentary elections in December 1991 with twice as many votes as the ruling FLN. However, the Parliamentary elections have always been intimately linked with the military, which by then had become seriously concerned at the prospect of losing power and privileges. They were not the only ones that started to worry. The Americans were not pleased with the FIS’s outspoken opposition to the first Gulf War, nor its pro-Palestinian stance. Algeria’s former colonial ruler France, which continued to have a strong hand in the country’s economy, grew increasingly nervous about the FIS’s rhetoric to phase out French language, culture and influence. Hence, Washington and Paris gave the green light for the Algerian military on 11 January 1992 to cancel the parliamentary elections’ second round and declare a state of emergency. Two months later, the FIS was banned altogether. 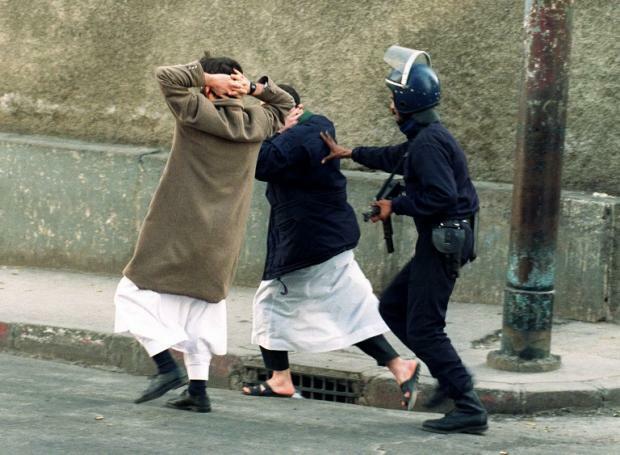 Seeing the Egyptian coup of July 2013 and subsequent ban of the Muslim Brotherhood, it seems the Egyptian military had not forgotten the early Algerian spring. “We pursued a policy of excluding the radical fundamentalists in Algeria even as we recognised that this was somewhat at odds with our support of democracy,” former US Secretary of State James Baker later explained. The Algerian people were to pay a heavy toll for the America’s selective love of democracy. Following the coup, tens of thousands of FIS members and sympathisers were arrested. Those who did not end up in a Sahara detention camp went into exile or took up arms. At first, the struggle was dominated by the Armed Islamic Movement (MIA), which was linked to the FIS. Soon, however, the mysterious Armed Islamic Group (GIA) appeared. Operating in and around Algiers, it was mainly the GIA that committed the most gruesome atrocities. Decapitations, for example, were a regular occurence in Algeria long before the Islamic State (IS) videotaped them and shocked the world through YouTube. While nominally Islamists, it is today painfully clear that the GIA was infiltrated by Algeria’s secret services. Several former Algerian intelligence officers have admitted as much. The aim of committing atrocities was to show the country’s Islamists in a bad light, break their support base and force the Algerian people to embrace the regime as the lesser of two evils. Some argue that the Syrian regime, at least to some extent, has taken played a similar game with IS. One could argue that from an Algerian regime point of view the strategy worked. Gradually, the violence declined and the war ended with the death of the last GIA emir Antar Zouabri in 2002. The country is still ruled by a triangle composed of the military, FLN and security services. Although the state of emergency was lifted in 2011, it is they who decide on the country’s main policies, postings and spheres of influence. Illustrative of the general state of affairs in Algeria is that for many years the country’s most powerful man was General Mohamed “Toufik” Mediène, head of the Department of Intelligence and Security (DRS). From 1990 until 2015, Algeria’s spy chief could make or break anyone. Meanwhile, Algeria has hardly moved an inch up the liberty ladder. The freedoms of expression, association and assembly are severely restricted. One journalist in 2016 was detained for questioning President Bouteflika’s health, another for questioning corruption. Corruption is rampant in Algeria. In 2010, the Sonatrach scandal erupted. Good for some 98 percent of the country’s foreign currency receipts, Algeria’s state-owned oil company has excelled in bribes and kickbacks for people linked to those in power. One Italian firm, for example, allegedly paid company officials $207m to obtain a contract worth $8.4bn. The country’s main highway connecting east and west is said to be the world’s most expensive road ever built. Still, while countries such as neighbouring Tunisia and Egypt were confronted with popular uprisings, Algeria in recent years remained relatively quiet. A mix of minimal political reforms and a rise in public sector expenditure seems to have done enough to keep people happy and off the streets. The question is for how long? In terms of freedom, fair representation and equal distribution, hardly anything has changed in the country since the late 1980s. Yet, as in the late 1980s, the oil price has crashed and Algeria is confronted by a growing economic crisis. Exports in 2015 nearly halved, the local currency decreased in value, while the fiscal deficit nearly doubled and youth unemployment increased to close to 30 percent. If the authorities are forced to cut some of the many subsidies that keep the poor on their feet, 11 January 1992 may suddenly seem a whole lot less than 25 years ago. – Peter Speetjens is a Dutch journalist who lived in Lebanon for 20 years, regularly travels to India and has a special interest in how 19th-century writers helped shape our conceptions of the world today.